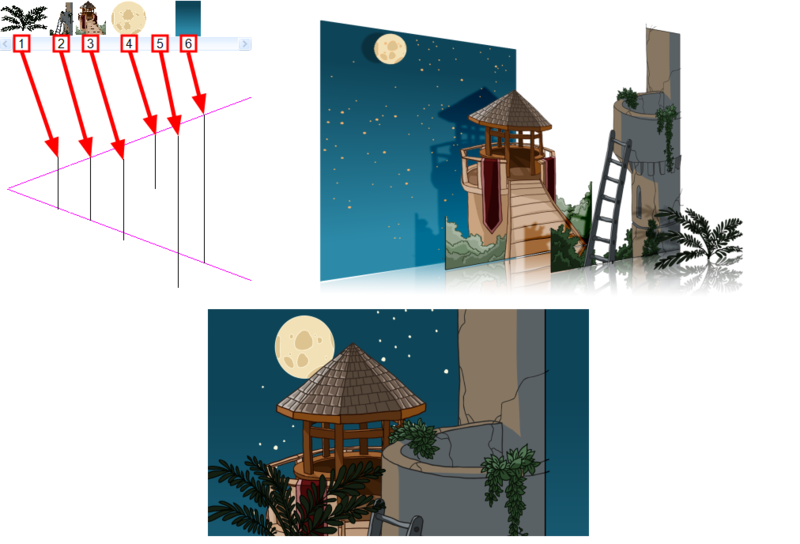 It is a good idea to keep a Camera view open to see what your scene looks like while positioning elements in the Top and Side views. Just like with other transformations, transformations on the Z-axis on a parent layer will also affect the apparent position on the Z-axis of its child layers. Therefore, a child layer's apparent position on the Z-axis can be affected by any of its parents. Once transformations on the Z-axis have been performed on several layers in a hierarchy, it may be difficult to keep track of which layers have been moved on the Z-axis and which ones have not. To help with this, it is possible to compare the selected layer's Z coordinate value with its apparent position on the Z-axis using the Coordinates and Control Point view or the Coordinate toolbar. Both these interfaces feature a field to tweak the layer's Z coordinate, which is independent from parent layers, as well as a field displaying the layer's cumulative Z coordinate, which is the sum of the Z coordinate of the selected layer with the Z coordinate of all its parents. 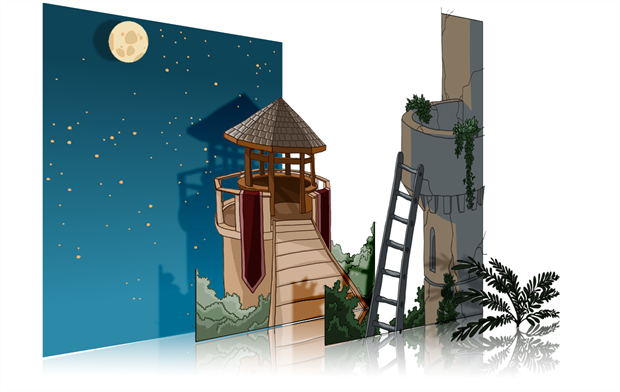 From the top menu, select Windows > Toolbars > Coordinate. Right-click on any visible toolbar and select Coordinate. From the top menu, select Windows > Coord. and Control Points. From any view already open, click the Add View button at the top-right corner and select Coord. and Control Points.